The event is designed to reduce illegal dumping on greenbelts as thousands of students move out and new ones prepare to take over their leases. Word has definitely spread about SMOP and many freegans were on hand to peruse the (non)merchandise. I took a look too, and while I left empty-handed, I collected a fair bit wisdom by examining seven items. A long coat made from emerald green velvet with a lavender satin lining and brass buttons caught my eye. Double-breasted and loosely constructed, it reminded me of something Kate Moss would wear to the opera with her haughty, aging-supermodel expression, after stepping into some crazy high heels. 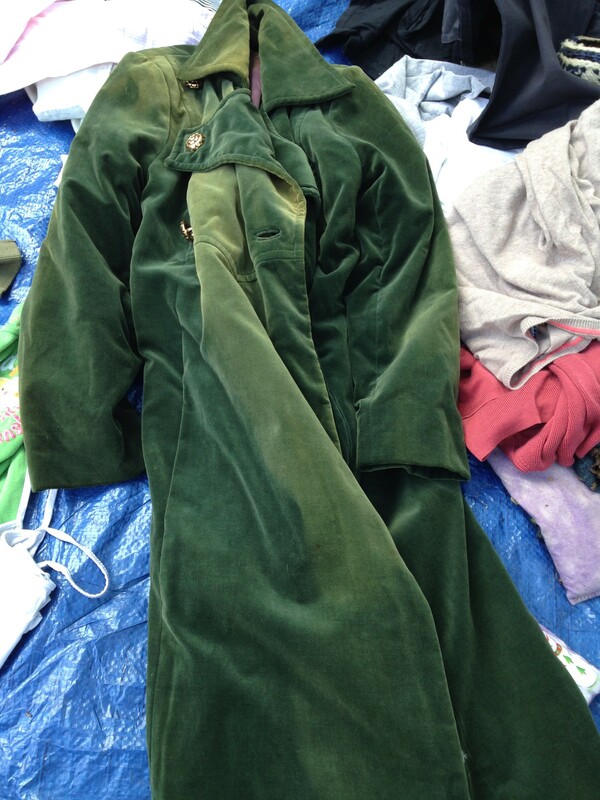 I wondered about the provenance of the coat as it lay crookedly against a blue tarp on the ground on Loomis Street. But before I could check the label and inspect the mild discoloring on the front, I was distracted by an excited cry of "Car coming in!" The crowd moved toward an SUV with Connecticut plates as it pulled into the swap zone. I walked over to watch a tatty couch being unloaded, and when I came back to the blue tarp, the green coat was gone. Moral No. 1: Don't get too picky. 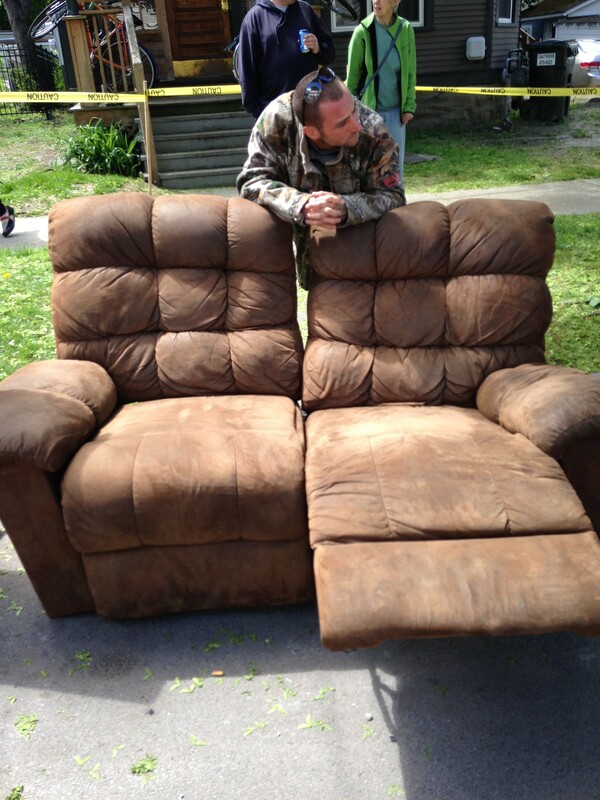 The next item that stood out to me was a chocolate-brown faux leather double recliner. Everything about it said "man cave." Perhaps it had started out in a den, with a bachelor who didn't know or care that it takes a rare woman to attach herself to such an ungainly piece of furniture. Maybe the guy came to understand this basic truth and outsourced the recliner to his nephew's college apartment. The kid loved it, until it was time to move on, let go and accept that form matters just as much as function. So it wound up at SMOP. At least this is the backstory I was imagining. Then, as I watched, a man loaded the recliner into a vehicle. Of course, I thought, smirking, he just couldn't resist. But as I eavesdropped on his conversation with the woman in the front seat I realized with a shock that the recliner wasn't for him. It was for her. Moral number two: Assume nothing. There's a board game for everything. g about them, as illustrated by my stereotyping about recliners. But who knew a board game exists to help novices like me master this tricky terrain? 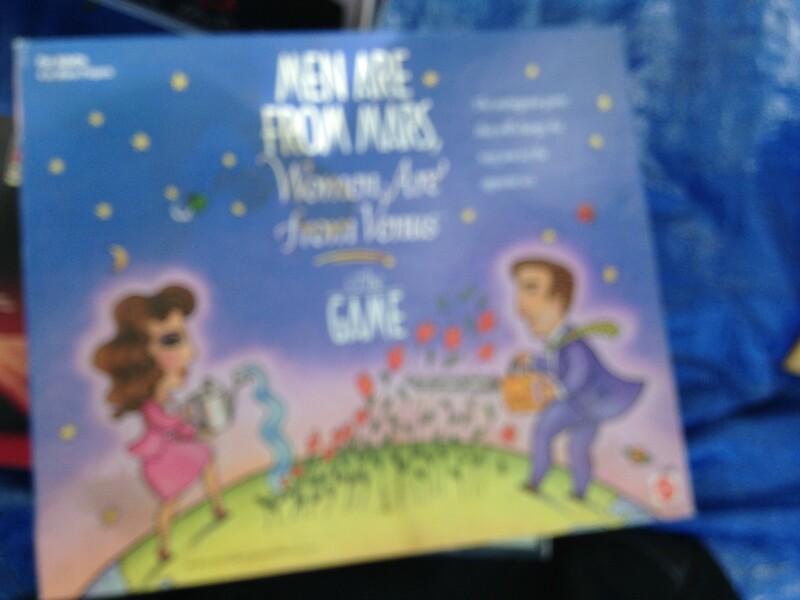 And wasn't it a coincidence that a spanking new edition of the Men Are From Mars, Women Are from Venus board game, based on the hugely popular book, was sitting atop a pile of jigsaw puzzles? Eagerly, I lifted the lid and peered at the directions, which quickly established that the 1,000-piece jigsaw puzzle of a sunset next to the game would be more elucidating than the game itself. Moral number three: Popular wisdom often isn't. I perused the pile of books littering another tarp. They promised to teach readers all kinds of useful things: how to knit a sweater, book an ecotourism vacation and understand the meaning of life with a little help from Plato . 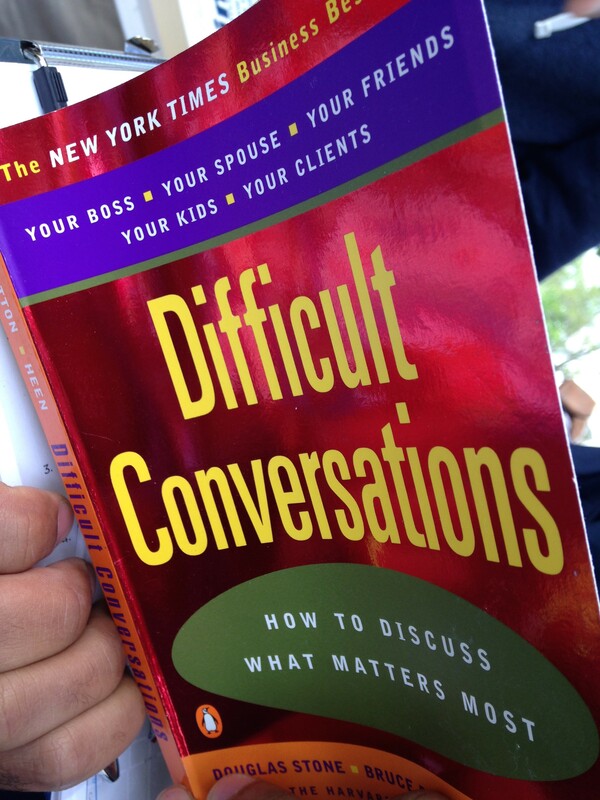 A young man named Dan Fairley picked up a copy of a self-help manual titled Difficult Conversations: How To Discuss What Matters Most. He decided to take it home. The 22-year-old UVM graduate student, who was among some 50 volunteers who helped run the SMOP, has a job supervising RAs in the dorms and also deals with parents whose sons and daughters are involved in conduct hearings at the university for breaking various rules. Not all the parents are as mature as Fairley, apparently, and he has to say no when they occasionally announce the following: "I don't want to pay the fine so make it go away." Moral number four: Trust in youth. Is it clear by now that possessions say a lot about us? Our quirks, our pasts — our feet? I spied a handsome pair of men's dress shoes made from soft, brown leather and wondered if I should scoop them up for a friend or relative. 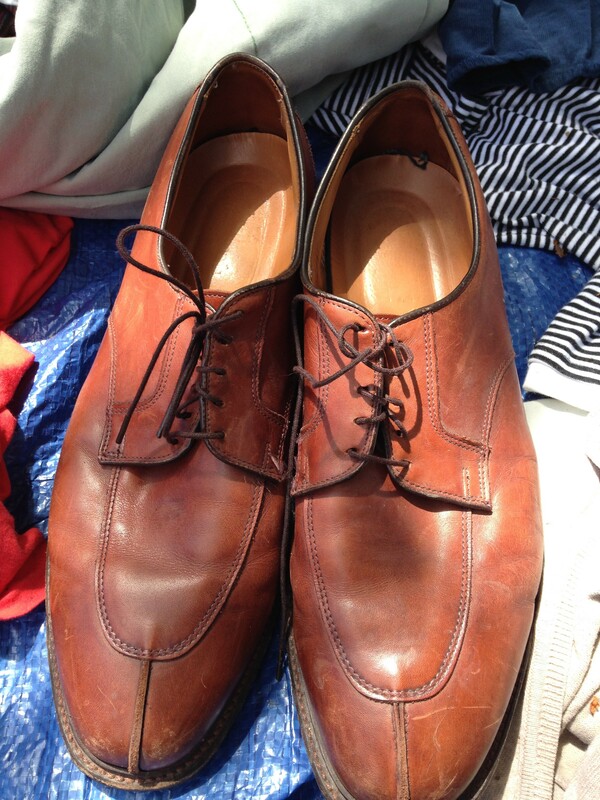 Then I realized the shoes were very large, so large in fact they looked like all of Loomis Street could fit inside. I picked them up because I had to know the size: 14. I immediately felt sympathetic for the former owner, who must have a very hard time finding footwear or even an ottoman large enough to accommodate such planks. I felt a surge of affection for my own size 8 1/2 feet, fallen arches and all. Moral number five: Be grateful for what you've got. Brenda Lee Riley looked pleased with the contents of her brown grocery bag: She'd found a curtain rod, a vase, and wall art of a glamorous woman vogueing in fur and shades. The Essex Junction resident was still looking for a carpet runner, but didn't let that get her down. The smile on her face was a reminder that free is good. "I like it all," she said, of the items all over the street. Moral number six: Leave home without a credit card more often. Amy Junger sat atop the three-drawer chest she found shortly after the SMOP began. "I just liked it. It's an old one, and it's pretty," she said. 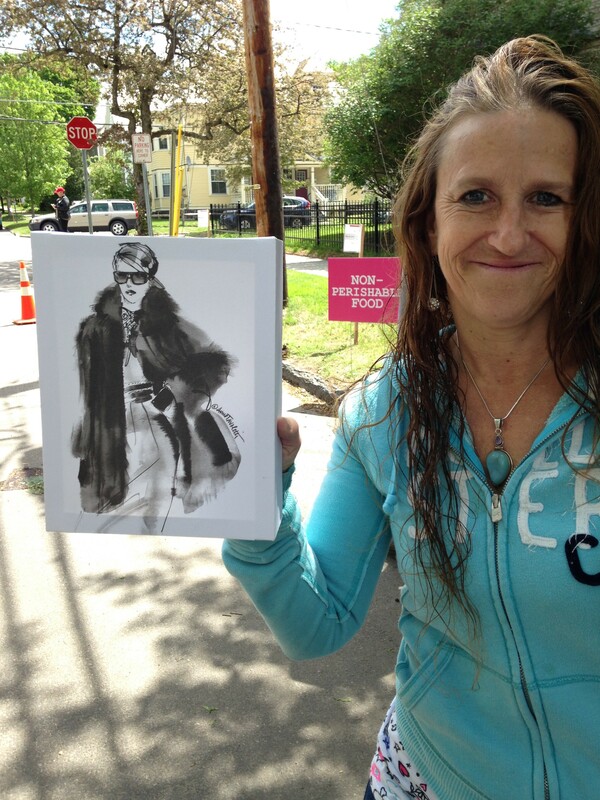 The Shelburne resident had heard about the event from her daughter, who just graduated from UVM. "I think it's great, I love recycling," Junger said. Their strategy was to have Junger stay with the items they wanted until they could load them into the car. Meanwhile, her daughter checked out new wares as they came in. Junger watched the castoffs arriving and carefully weighed the fix-up time required, rejecting some items and quickly claiming others. 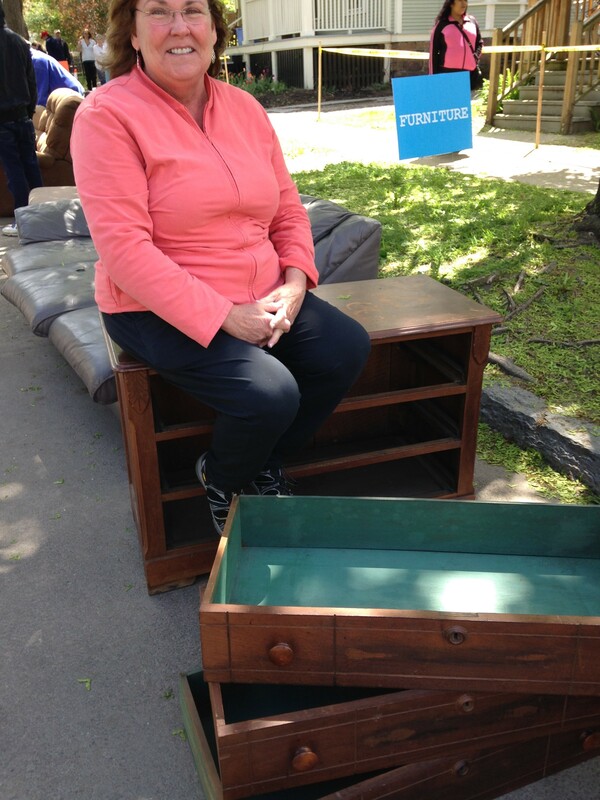 As a wooden bureau on casters appeared in the swap zone, she called out to her daughter: "Get that dresser!" Moral number seven: Be decisive.